Hello friends. 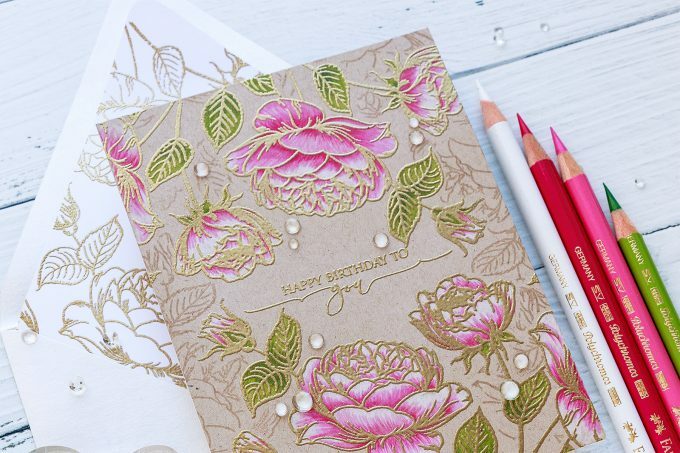 It’s been awhile since I last used my favorite colored pencils from Faber Castell so for today’s video I decided to do some pencil coloring for a one layer floral card featuring stamps from Gina K Designs. I picked a stunning floral cluster from the Tropical Blooms stamp set for my card. I went with this image because of its size and the amount of white or open space. Whenever I do pencil coloring I make sure that the image I pick for my coloring is large enough and not too tiny so that I can actually do some color blending. I stamped this image 4 times in total (twice on top and twice on the bottom – mirrored) onto Desert Storm 80lb cardstock panel (using a stamping platform) and colored each with the help of Polychromos colored pencils. #170 May Green along with #175 Chromium Green Opaque to color leaves. I did very simple coloring with minimal layering and blending. You don’t need to go crazy here and do a ton of blending because this image already has gorgeous detail to it and the image illustration itself does a lot of work for you, so there’s no need to spend hours coloring this and adding shadows and highlights (unless you want to!) as the image outline, once applied, will add that for you. The way this floral cluster is illustrated you have little shaded areas that tell you where you need to apply your darkest color. This is very helpful if you are not sure how to color. For the most part I started with a darkest pencil for each petal, next added medium and finished it off with white. You can also lay down white pencil as a base layer and it will lighten up the entire section. This is a good trick to use if you don’t have enough colors. You can use white to substitute for the lightest color and you can also use gray pencil to substitute for the darkest color. Once my coloring was finished I heat embossed image outlines using Gold embossing powder from Hero Arts. I also heat embossed a beautiful sentiment that reads “Happy Birthday To You”, this one comes from Scripty Saying One stamp set. I wasn’t quite sure which stamp I wanted to use for my sentiment so I didn’t stamp it to begin with, but usually when making backgrounds like this where the sentiment is a part of a background it’s best to do the sentiment first and everything else later, as later you might simply not have the space for the sentiment. Next, I did some more watermark stamping in the background. I’ve die cut masks for my image using a coordinating die and masking paper. I added my masks in place and stamped same floral cluster onto the background. 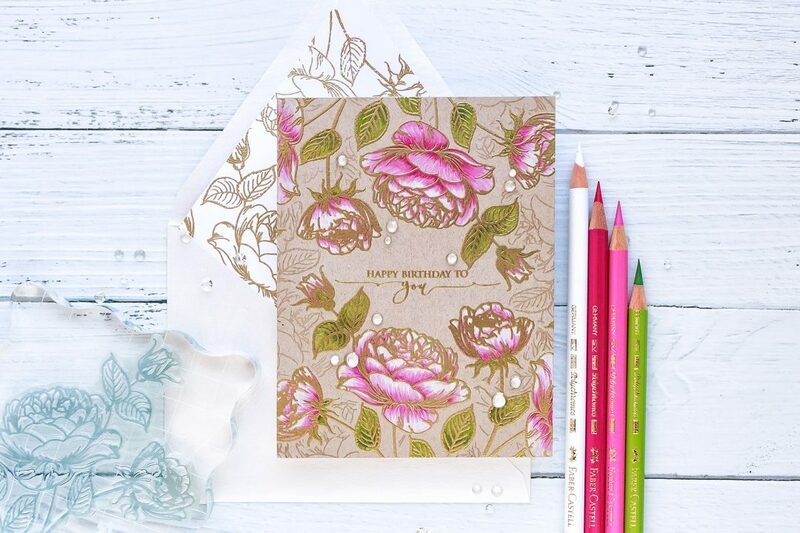 It doesn’t show much as it is stamped in watermark ink, but it helps fill this floral background in and makes it look like a once seamless piece. I adhered my background onto an A2 white card base and used Sparkling Clear Jewels from Pretty Pink Posh to dress this card up. Finally, I also made an envelope liner with gold heat embossing to coordinate with this card. As always, such a beautiful card. Yana, I tried to find that Faber Castell color chart and was unsuccessful. Can you direct me to the location? Much thanks. I’m glad you like this project, thank you! This is stunning! 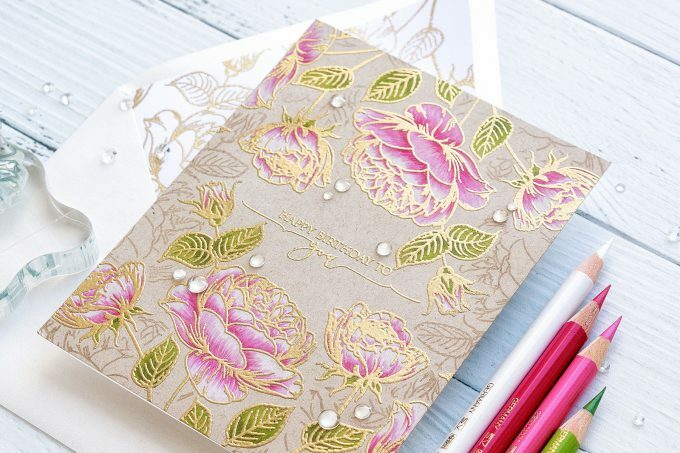 Love your colouring AND the gold embossing! The stamp itself is pretty good too! Gorgeous! I’ve been watching you do wonders with these Polychromos pencils for some time now, and I recently splurged on a small set (12 pencils). I do love them. I can’t wait to give this a try! Thanks, Yana. , for the envelope idea. 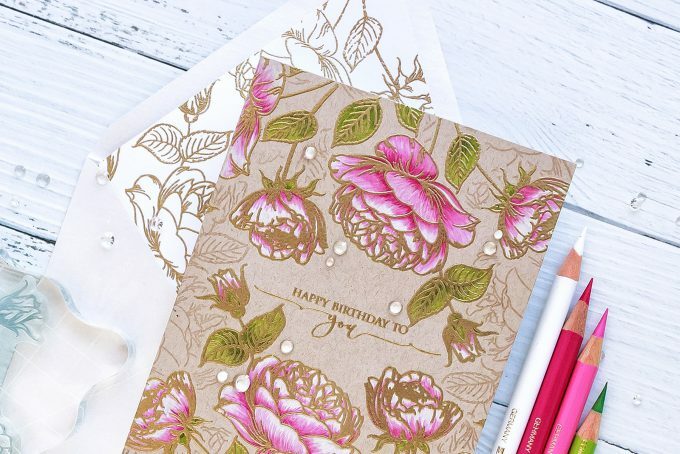 I just found a couple pads of decorator paper that I had accidentally duplicate purchased and this would be a very good way to use up those beautiful papers. Oh Yana! This card is stunning! You have done a beautiful job! Wonderful! Gorgeous, Yana! Love the pretty design & those beautifully colored flowers! This is so beautiful!!!! Love this masterpiece! Gorgeous, I love the pink and gold combination colors. This really IS a stunning card Yana! Who wouldn’t be thrilled to receive this? ♥ it! Gorgeous card! 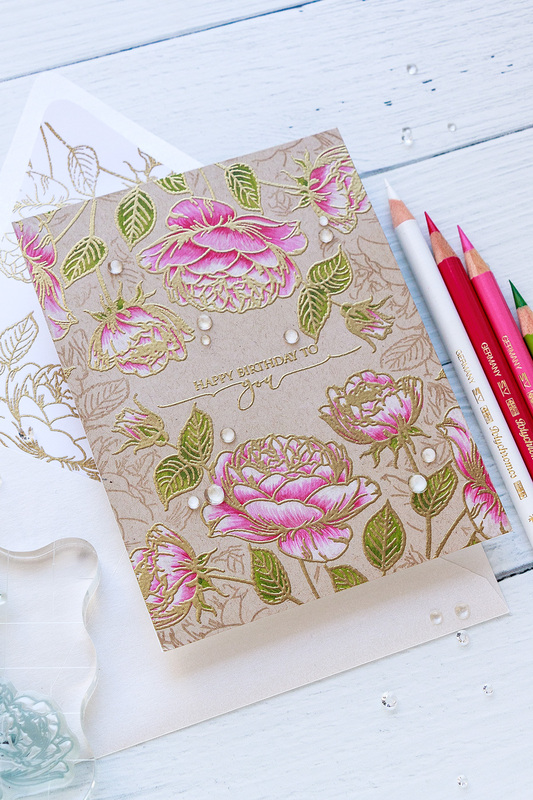 The gold embossing over the beautiful pink coloring is stunning! Thanks for sharing how you made the envelope liner. That’s such a nice finishing touch. 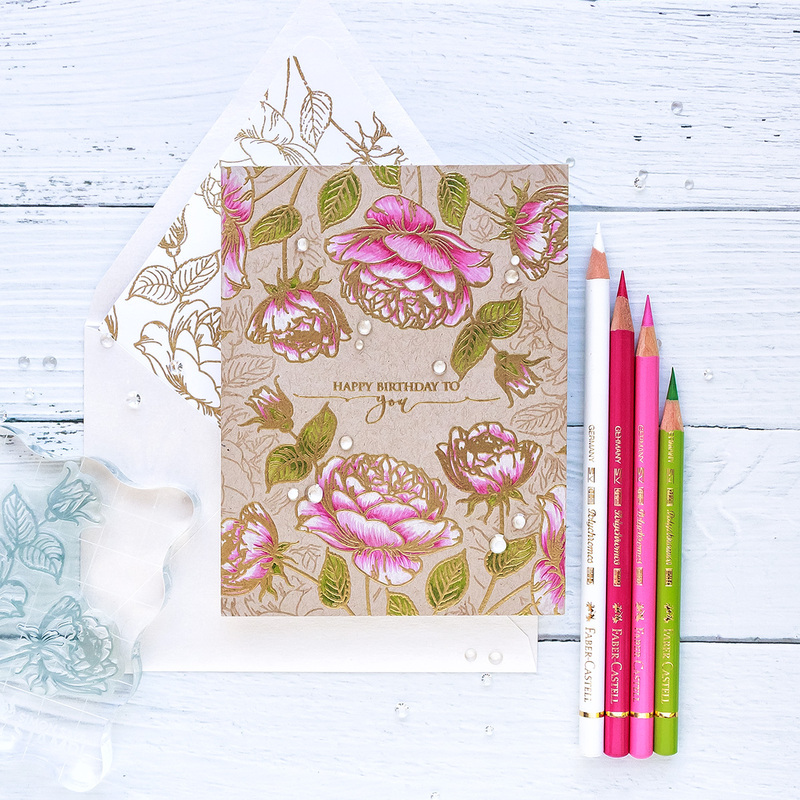 Love your card and what a great way to make a beautiful and matching envelope liner. Thanks for all the tips.